It seems each year as February sneaks up on us it is easy to put aside those New Year’s resolutions that we made so earnestly just a month ago. Well, this year is going to be different! The Beacon House Inn has partnered up with some of the best health and wellness experts on Pleasure Island to bring you our first Seaside Spring Renewal Retreat. This retreat will focus on eating healthy, whole foods for energy and strength with classes from Island Wellness. 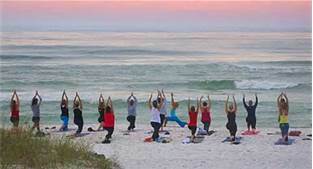 You can see how yoga will provide balance and serenity for both your body and mind at the Salty Dog Yoga Studio. Our Spring Renewal Retreat will be more than another weekend to relax at the beach. We want you to leave with the tools you need to live your best life! Ok, we realize that no beach trip is complete without just a little indulgence, so we will greet you with a wine and cheese reception upon arrival. We will also enjoy a three-course group dinner at the Surf House Café, known for their use of fresh, local ingredients. When the weekend comes to a close, we will send you home with a goodie bag too! We invite you to reserve your space now at our first annual Spring Renewal Retreat! Call or email us for reservations. This entry was posted in Bed and Breakfast, Special, Spring Event by admin. Bookmark the permalink.